This new series features carefully selected performance repertoire of the great masters from all eras. Each piece is accessible to students and creates a feeling of accomplishment. Diverse in style and expression, each selection features melodic, rhythmic, or harmonic patterning to allow for ease in teaching and memorization. 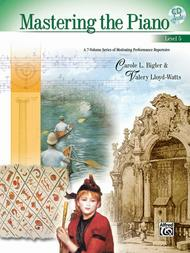 The CD, performed by Valery Lloyd-Watts, provides a powerful auditory tool for musical interpretation. Lloyd-Watts studied at the Conservatory of Music in Toronto and the Royal College of Music in London. She earned a Master of Music degree from the University of Wisconsin, where she studied with Paul Badura-Skoda. She co-authored the text Studying Suzuki Piano: More than Music, which was endorsed by Dr. Suzuki. this book contains a nice selection of pieces. The CD is an excellent addition as a learning tool or simply to enjoy. 18 of 33 people found this review helpful. format is clean and clear, and I especially like the choice of 20th cent. literature - in this case the exciting "O Polichinelo" by Villa-Lobos. These are indeed motivating selections!